As this RT article demonstrates, both Western and Eastern mainstream and alternative media sources are attempting to sell us the idea that the NDB is being developed as an alternative to the UN’s World Bank and IMF, and that it is part of the larger conflict between East and West. But as I’ve gone to great pains to document in my NWO section, this conflict is phony and is being staged as a public relations maneuver to get the public to accept the New World Order. 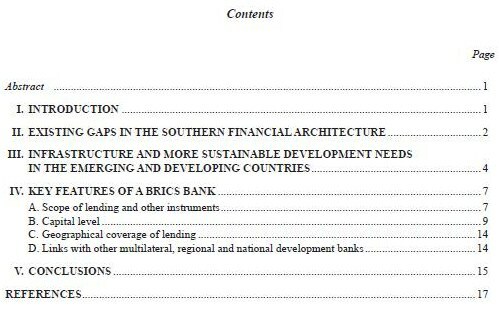 …we see how it talks about the NDB filling gaps in the globalists’ “southern financial architecture” and providing investment for “infrastructure and more sustainable development needs in the emerging and developing countries.” It also talks about how the NDB will link-in with other multilateral, regional, and national development banks (the financial side of the NWO). 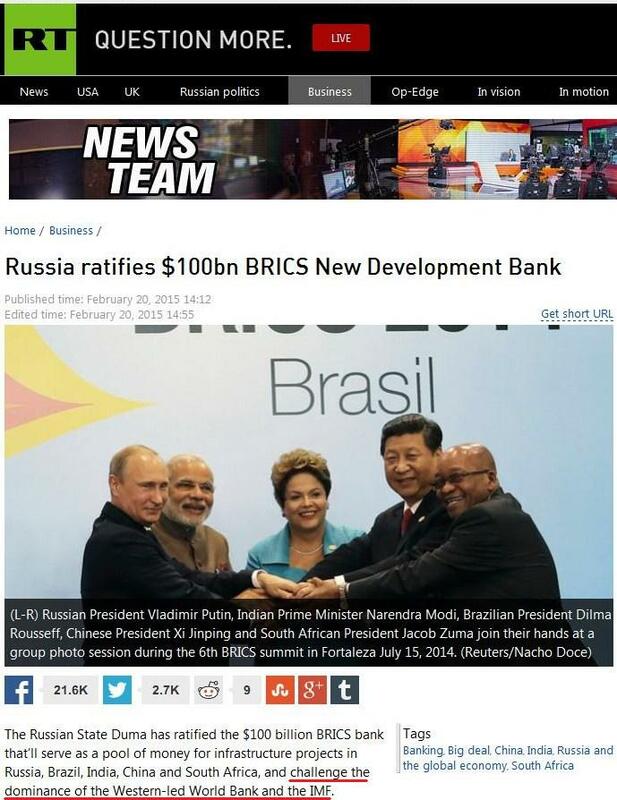 If there were an actual conflict between the BRICS and the “Western-led” (as RT puts it) financial institutions, you’d expect a UN paper to whine about the NDB, not promote it. Isn’t that so? They would be complaining about the “divisive agenda” of the NDB instead of talking about how well it will fit in. Obviously, there is no real conflict; there is only the illusion of conflict being propagated in the media. …we see that it talks about how the NDB will play a “complementary role” (NOT a conflicting role) with existing development banks. 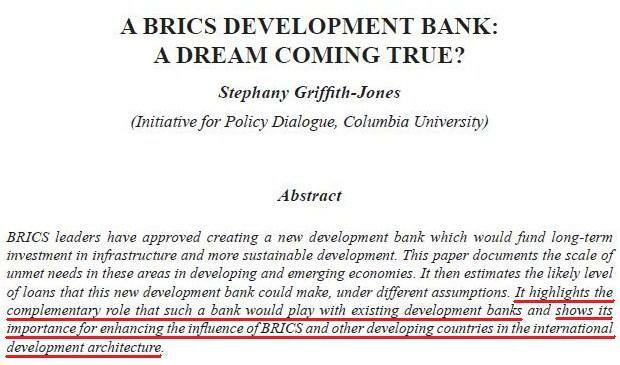 And it mentions the NDB’s “importance for enhancing the influence of BRICS and other developing countries in the international development architecture.” In unspun words, forming the NDB is an important step in drawing the developing countries into the globalists’ multilateral spider web. On the one hand, you have developing countries like China who have lots of extra cash, and on the other, you have other developing countries which are short on cash. The NDB brings those two hands together within a multilateral framework. The multilateral framework ensures that all nations involved cede key aspects of their national economic sovereignty to the supranational institution. Whether a nation joins a supranational development bank or merely borrows from one, there are rules that must be followed, and those rules tie the hands of the national governments. 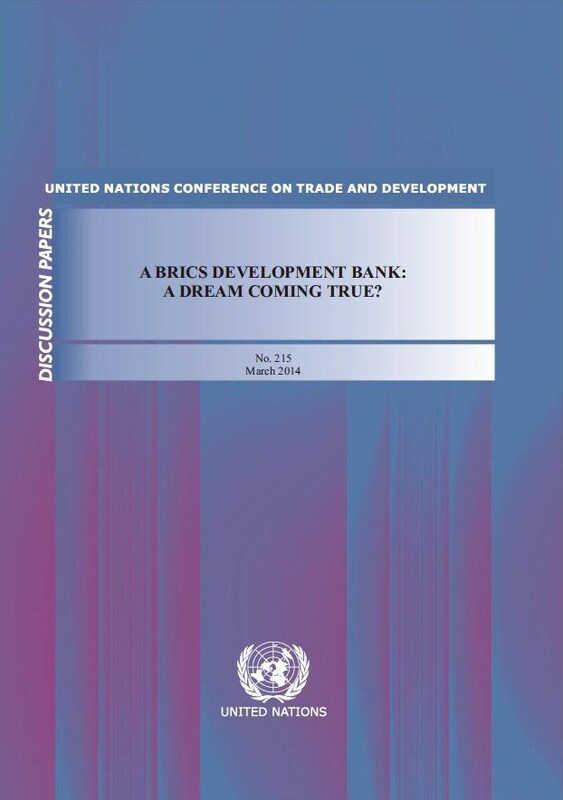 As to the broader strategy behind the globalists’ creation of the NDB, the fact that it will appear to be “BRICS-owned” makes it easier for governments to justify going into debt. A population that might be resistant to their government borrowing money from “Western imperialist” institutions like the World Bank or IMF might be less hesitant about borrowing from the BRICS “freedom fighters.” Their government can say, “We’re borrowing this money from the good guys, not the bad guys, so we don’t have to worry.” Since all these international institutions are run by the Occulted Powers from behind the scenes, though, they will still be borrowing from the same people. Instead of borrowing from the globalist left hand, they’ll be borrowing from the globalist right hand. It will be no different than what has gone on before. 2) the need for a pool of cash to draw upon during times of crisis. “The Chiang Mai Initiative (CMI) is a multilateral currency swap arrangement among the ten members of the Association of Southeast Asian Nations (ASEAN), the People’s Republic of China (including Hong Kong), Japan, and South Korea. It draws from a foreign exchange reserves pool worth US$120 billion and was launched on 24 March 2010. That pool has been expanded to $240 billion in 2012. …Problem / reaction / solution strikes again. 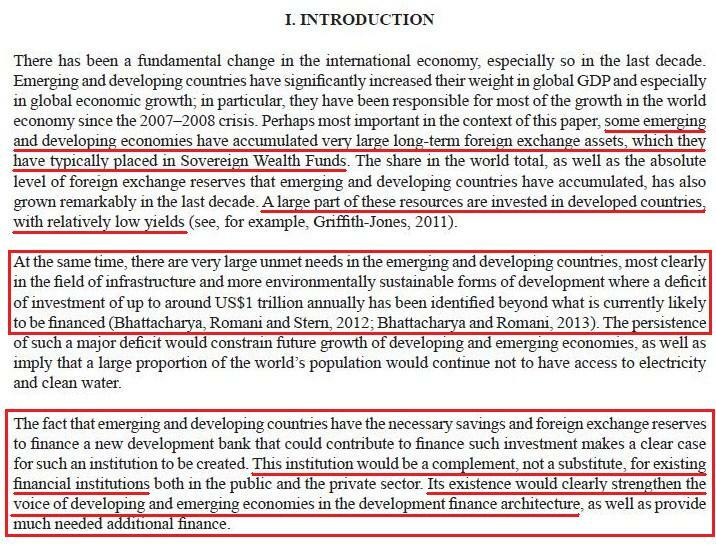 Continuing on with Section II, the paper points out that the “Chiang Mai Initiative Multilateralization (CMIM)” has a provision that requires the member nations to seek IMF approval if they wish to access the majority of the available funds, and it goes on to explain that the BRICS Bank’s Contingent Reserve Agreement (the BRICS version of the “pool of cash”) would have the benefit of not requiring such approval. This raises an obvious question: why would a UN paper be lauding such a feature? The answer, of course, is that such an arrangement is necessary in order to carry out the globalists’ “governance reform” script. When the next “Lehman Shock” is triggered, the BRICS will be able to stand on their own feet and weather the storm while the West and the IMF flounder. 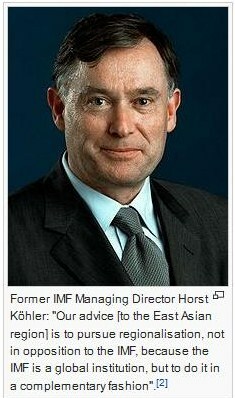 This will put them in position to step up and “save” the West and the IMF in exchange for “reforms.” In this way, the NWO will rise like a phoenix from the ashes of the next Lehman. For the previous updates in this series, click here. This entry was posted in Globalist Agenda Watch 2015, NWO on February 22, 2015 by kenneth.